Nikki Slade & Guest teachers Christopher Hareesh Wallis ( Scholar of Sanskrit, Yogic and Tantrik traditions), Katy Appleton ( appleyoga. Yoga for Voice) and Tom Simenauer ( Tabla studies). Are you passionate about Kirtan and chanting from the heart? Have you ever felt that you are a budding Kirtan leader waiting to emerge? Do you see yourself sharing this sublime and exquisite practice with the world? Autumn 2019 offers you the Yoga Alliance Professionals accredited, 200 hr. Learn To Lead Kirtan Foundation training in London. Applications are now open. Book now. 3-week mastery development period includes 2 group practice days (the first two saturdays listed) with Nikki with hands on coaching to perfect your leading skills. Includes 1 private individual session with Nikki (Privte extra date to be booked with Nikki). Personal assignment time to integrate your practice. 2x 2hr. saturday morning or afternoon practice days in smaller groups. 7th – 11th & 18th October 2019. 3-week mastery development period includes 2 group practice days with Nikki with hands on coaching to perfect your leading skills. Includes 1 private individual session with Nikki. (Private extra date to be booked with Nikki). 9th & 10th November (both days need to be attended). 17th November 2019 (obligatory to attend). This is a Big commitment!… Can I miss any dates? As it is a certified 200hr training, you are permitted to miss a maximum of 1 Friday and 1 Saturday session only in the whole training and for each session missed, the student is required to book a 1-1 private catch-up session with Nikki at £125.00 per session. Friday 27th September and Saturday 28th September 2019. Friday 4th October and Saturday 5th October 2019. Friday 25th October and Saturday 26th October 2019. Friday 1st November 2019.Obligatory dates: All other dates are Module days or mock assessment days, main assessments or our completion day and MUST be attended. Early Bird: £2,450 . Extended. Pay in full by 31st December 2018. Please note we can offer an instalment plan upon application. This option is only available if you apply before 1st July 2019 and the full fee must be paid by beginnig of September 2019. Venues: TBC. Main Modules days held at The Study Society, Baron’s Court, the Practice integration days are held at Union Station Yoga, Battersea on all Fridays and at Evolve, South Kensington on all Saturdays. Are you ready to apply? If YES go to the next tab to find out the pre-requisite requirements and application form. To avoid unnecessary administration, please check your finances and check that you can do all dates required before applying. If you haven’t yet made your mind up about it, we recommend that you attend our Lead Kirtan taster days to give you a greater idea of what the training can bring to you. Visit the link or our events page to see dates. 2019 Applications are open now. The application is a 3 step process. Please check the pre-requisites below and make sure you meet all the requirements. Before you send your your application, check you can attend all the dates required and your finances to avoid unnecessary administration. Submit the application form (with ALL questions answered) and a short audio recording of your voice. Within 3 weeks we will announce whether you have a place in the course. Have you engaged in a combination of Kirtan and physical Yoga practice for a minimum of 2 years. (It is fine that you may have done one form of these practices more extensively than the other). Are you someone who has attended at least 10-15 Kirtan classes or workshops either with Nikki Slade or other Kirtan leaders around the world? Are you someone who chants regularly with Kirtan call and response recordings with e.g. Nikki Slade or Krishna Das, Deva Premal, Jai Uttal, Wah or other? Please note we will require you to send back an audio file attached with an example of your singing voice singing the first 4 lines of “Somewhere Over the Rainbow” from The Wizard of Oz as this is the way we will be able to be ascertain the musicality of your vocal skills for this training. Please fill the application form on the next tab and send over your recording. 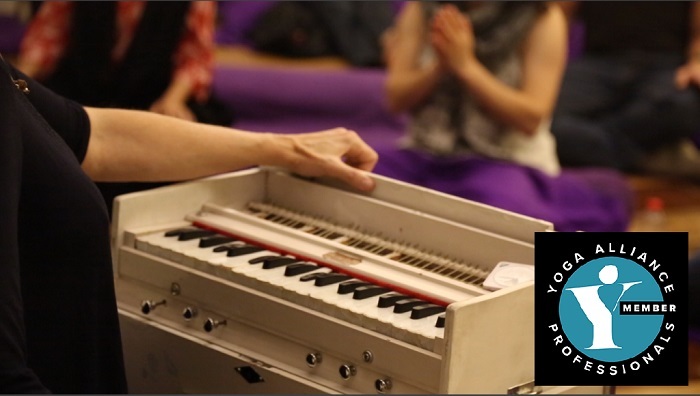 We are open for applications for the 2019 Learn to Lead Kirtan Foundation Training now. We appreciate your enthusiasm but DO make sure you can do all dates required and that you can pay for the training before you apply. Within 3 weeks of your application form being received, we will announce whether you have been accepted. Please name the friend colleague teacher organization or other who referred you to us? What is your spiritual path philosophy? Who is your teacher in your field of transformation yoga meditation or other? What is your previous experience of Kirtan? Can you sing in tune and in key with a musical instrument accompanying you? Do you have a basic hatha yoga practice? Who are your teachers? Have you any physical injuries? It is a requirement for the Learn to Lead Kirtan Foundation training that you have a mentor or psychotherapist available to you on stand-by in order for you to participate in this training as the intensity of this course is powerful and we request this to ensure that you have this support available to you at all times during the training in case it is needed. We will ask you for signed proof from your therapist, counsellor or mentor ahead of the training. If you are already in psychotherapy or counselling, please let us know which type you are attending and why. Please note we are happy that participants are in psychotherapy or mentorship programmes, if that is what you need to support you throughout your participation. If you know you have any conditions that need extra support, please take responsibility for your own wellbeing. Do you have a history of BI-POLAR or PTSD? If so we are sorry but this training is not suitable for you. Please also inform us if you are currently taking any medication for any physical, or psychiatric conditions?